If you think of gatekeepers as cold calling obstacles or (worse) as opponents to outwit, you are missing some significant opportunities. It's true that there are a few receptionists and assistants out there who delight in giving salespeople a hard time. Nevertheless, the vast majority of gatekeepers will treat you much the same way as you treat them. Your average gatekeeper is overworked and underpaid. They know a lot of “inside information” about their boss and possibly about other decision makers as well. And he's used to salespeople trying to trick or bully their way past him to get to the management level. Not surprisingly, he probably has a pretty low opinion of salespeople as a group. For your part, getting gatekeepers on your side will do wonders for your sales record. If you can convince them that their bosses will benefit from speaking with you, not only will they give you access to the decision maker, they'll be able to tell you all sorts of useful information... like how their bosses really feel about the company's current vendor, for instance. Gatekeepers are often also aware of internal company politics, which can be incredibly useful when you're dealing with a buying committee. Always start out on the right foot with a gatekeeper by being polite and respectful. Use “please” and “thank you” and don't forget a pleasant tone of voice. And never try to trick the gatekeeper into letting you past by pretending to be anything other than a salesperson. 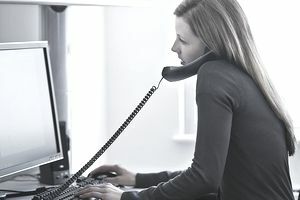 Most experienced gatekeepers will pick up on your identity instantly—salespeople who spend a lot of time cold calling inevitably develop a “smooth” tone of voice from the sheer number of phone calls they make. Since any gatekeeper will be used to salespeople who try to sneak past them, stand out in a good way by doing the opposite. Give your full name and company name, and if they ask, tell them it's a sales call. If a gatekeeper announces that he'll be shunting you into voicemail now, ask if there's someone else you should be speaking with regarding (whatever it is you sell). Or ask if there's a better time to call or a better way to reach the decision maker, such as email. By asking for advice you're both showing that you respect the gatekeeper's knowledge and treating him like a person, not a malfunctioning piece of office equipment. If the gatekeeper gives you his name, write it down immediately and use it once or twice in the conversation. Stick it in with the rest of the information you've got about that prospect. The next time you call, assuming that the same gatekeeper answers the phone, say something like, “Hi, Joe, this is Fred Smith—I talked with you on Tuesday.” Then work in something from the last conversation. For instance, if Joe said that he was really busy and didn't have time to talk, say something like “You were really swamped Tuesday! How are things going now?” Again, treating the gatekeeper like a person will make him more inclined to do the same to you. Once you develop a friendly relationship with a gatekeeper, it might be a good idea to add them to your network. Gatekeepers can not only keep giving you important info about the company they work for, but they may well know other gatekeepers and can help you out by asking their friends to give you access to decision makers.